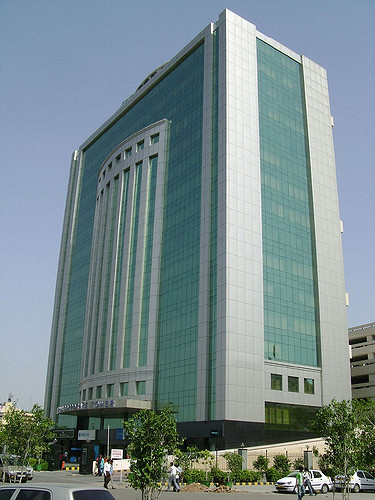 Features : Centrally Air-Conditioned, 100% power back-up facility, 24 hours building security, High Speed Elevators, Multi-level car parking inter connected to office building. Description: Eros Corporate Tower is strategically located in the Nehru Place District Centre situated opposite to Nehru Place Metro Station. The tower is one of the world class premium addresses in the business world.It is the time to mark your distinction with Eros Corporate Tower as your business address.Many leading multinational companies like Microsoft, Barclays Bank, Hitachi, Jetro, BT India Pvt. Ltd., Sinosteel India, Suzlon, Finmeccanica, Sojitz India, Nippon Express, Axis Bank, Russell Reynold, Regus, Korean Exim Bank, OOCL India, Royal China etc., have chosen to operate their businesses from this tower with its perfect location. It is a sixteen storey commercial tower with interconnected seven storey car parking which can accommodate 1000 cars and 50 buses, thus being just one of its kind to match international quality standards.